Here’s your list for the week! Thanks to Cordite Country blog for this lovely image! If you are new to fennel, try not to be intimidated. My favorite way to make it (and by the way I am no expert on fennel) is to roast it. Remove top part and leave only the bulb. Place bulb on its bottom after removing the tough portion. Quarter the fennel and toss in olive oil. Roast for about 20 minutes on 375. Would be wonderful with sauteed or roasted pear. You could toss in pasta with olive oil for an easy dinner. Fennel can be eaten raw. Slice very thin and toss into salads. Tuscan White Bean Sauce would be great over pasta with roasted fennel or sauteed kale on the side. For a southern style meal, make some mashed sweet potatoes, steamed kale seasoned with hot pepper sauce, and cornbread for dinner. Great on a cooler night! 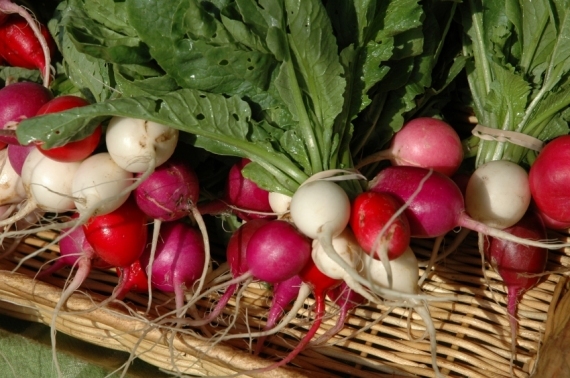 Radishes always remind me that lots of produce is on the way. It is usually the first thing I plant even though I am the only one in my household who likes them. I can’t resist the quick germination and rapid growth–three weeks from seed to table. Yum. If you want to preserve your carrots and radishes, they are perfect for a quick pickle. See blog for pickling recipe. This is probably the last winter squash we’ll have in Weekly Harvest this Winter, but you never know…..Acorn squash are great for stuffing with rice, quinoa, or eating alone with a small pat of butter and salt and pepper. If you are craving sweetness, sprinkle a little brown sugar or maple syrup on the squash after it is done roasting in the oven or during the last few minutes of baking. It’s almost Valentine’s so let the decadence begin…. The arugula pesto can obviously be paired with the Porcini Tagletelle. It would also be great mixed into scrambled eggs, as a filling for an omelet, as a sandwich or wrap spread, mixed with cream cheese, as a pizza sauce, or even mixed with grains (quinoa, rice, or even wheat berries) and tossed with sautéed vegetables. And lastly, the BBQ sauce would be great to use for baked beans, on burgers, and even in place of ketchup.